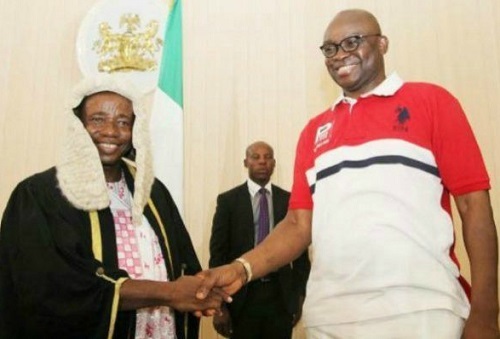 The Speaker of the Ekiti State House of Assembly, Kola Oluwawole, has been impeached. The lawmaker was impeached this morning in a move reportedly spearheaded by just three APC lawmakers in connivance with some aggrieved PDP members of the House. According to Channels, 14 members of the assembly impeached Oluwawole and immediately elected Ebenezer Alagbada to replace him. The lawmakers also removed the deputy speaker and principal officers of the House and also announced the suspension of some members. They cited abuse of office and mismanagement of the resources of the House among other reasons for their actions. The development is coming few days to the expiration of the tenure of the incumbent governor of the state, Mr Ayodele Fayose.